Minnie’s Bake Shop White Chocolate Raspberry Cookies are loaded with white chocolate chunks and ribbons of sweet raspberry jam. One bite and you will know why they are a fan favorite Disney snack. Anyone who knows me understands that one of my main reasons for travel is to eat. Even before activities are planned, lists of must eat foods are created and reservations are made. If I can’t take any of the culinary creations home with me, I try to find a recipe. Recreating these tasty travels recipes at home helps bring back memories. 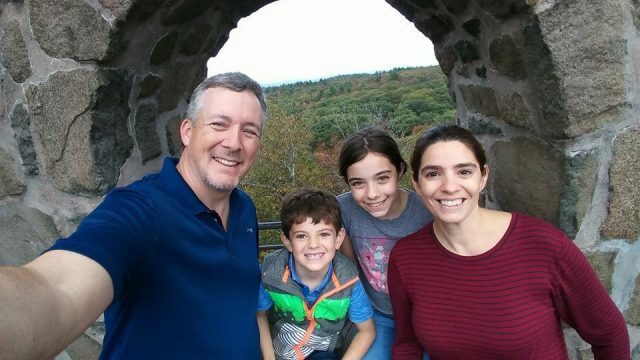 This year, I’ll be sharing recipes from our favorite destinations through our ‘tasty travels’ series. First up, some of my favorite Walt Disney World recipes. Visitors to Walt Disney World take home many different types of souvenirs. Some purchase mugs or pins. Some take home collectibles or themed clothing. But then there are others who want to savor the taste of their vacation long after it’s over. They’ll take home baked goods, especially if they’re from Minnie’s Bake Shop. This grab and go line of gourmet and character themed cookies, exclusive to Disney Parks, are a favorite take home among guests. Sorry to burst your bubble, but Minnie does not actually bake the cookies herself. They’re baked off site by Selma’s Bakery. 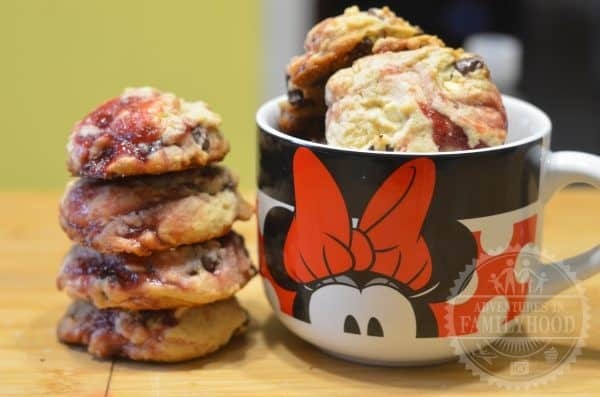 Selma’s pride themselves for baking “colossal confections for ‘cookiethusiasts’.” The oversized cookies, packaged as Minnie’s Bake Shop, come in a wide variety of flavors such as Peanut Butter, White Chocolate Raspberry, White Chocolate Chip, and Chocolate Chip Peanut Butter. They can be found at gift shops throughout Walt Disney World’s parks and resorts. The most popular is the Minnie’s Bake Shop White Chocolate Raspberry Cookies. 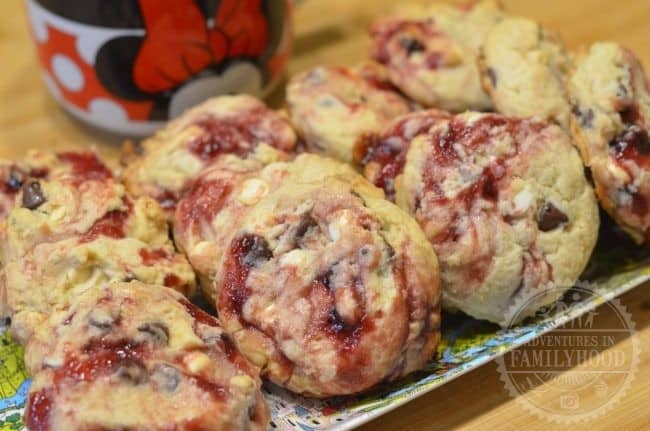 These are loaded with white chocolate chunks and luscious ribbons of raspberry jam. The actual recipe is a well guarded secret. But thanks to the Internet, I was able to piece together a recipe that comes close to the real thing. Combine butter, light brown sugar and confectioner’s sugar into the bowl of a stand mixer. Beat until creamy. Add in egg, vanilla extract and raspberry extract. Mix until well combined. In a separate bowl, measure flour, salt and baking powder. Mix until combined. With the mixer on low speed, add flour mixture in a little at a time. Dough should be dense and stiff. If not, add in an additional ¼ cup of flour. Fold in white and semi sweet chocolate chips. Divide dough into 4 batches. Refrigerate the rest as you work with each batch. 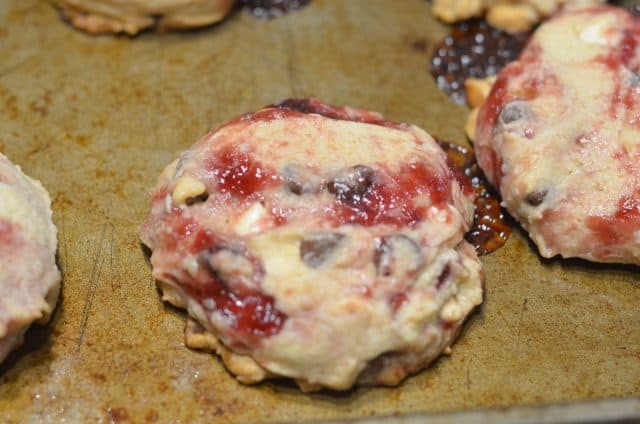 Place raspberry jam into a piping bag or food storage bag (with tip cut off). Pipe about 2 ounces of the jam over the dough into a swirl. Use a butter knife to cut the jam into the dough. (I did a few horizontal and a few vertical lines) Be careful not to over mix or the dough will turn pink. 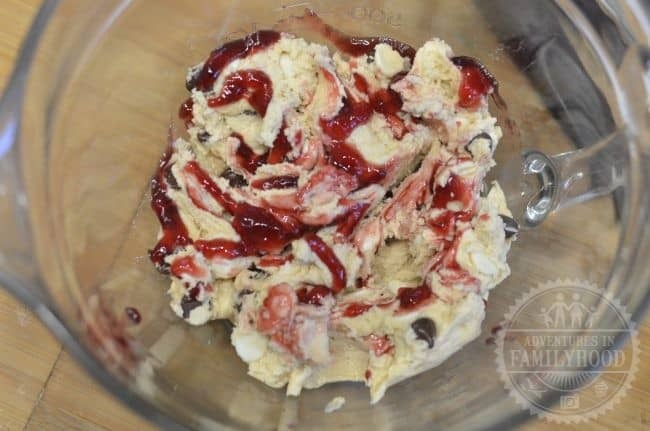 Using an ice cream scooper, scoop out dough into balls and place on a foil tray or plate. Freeze the balls for 15-25 minutes. Repeat the process with the remaining 3 batches of dough. Place the cookies on a parchment lined or well greased cookie sheet. Bake for 2 minutes at 400 degrees. Lower the temperature to 350 degrees and bake another 15-20 minutes or until done. Let cookies rest on the pan for 10 minutes before transferring them to a wire rack to cool for another 15-20 minutes. 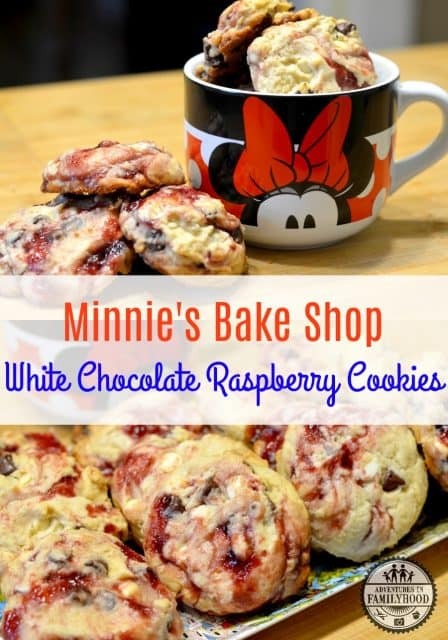 On our last visit to Walt Disney World, we picked up a package of the actual Minnie’s Bake Shop White Chocolate Raspberry cookie for comparison sake. Not to toot my own horn, but I think I did a pretty good job recreating these babies at home. Give it a try. Let us know how it goes in the comments.